Nest of Asian Paper Wasps overhanging from a bougainvillea plants. The paper wasps in this photo have a single yellow ring (taper) on it's abdomen. Paper Wasp, common name for medium- to large-sized wasps that construct nests made of a papery (papier-mache-like) material formed by chewing plant and wood fibers together with saliva. 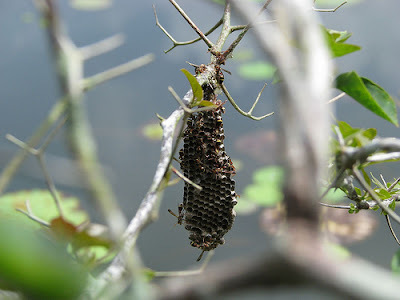 The nests consist of a single upside-down layer of brood cells (compartments for the young). There are approximately 700 species world-wide. Most are found in the tropics of the western hemisphere as well as tropical regions. Paper wasps are sometimes called "umbrella wasps" because their nests consist of a single exposed comb suspended by a narrow stalk. 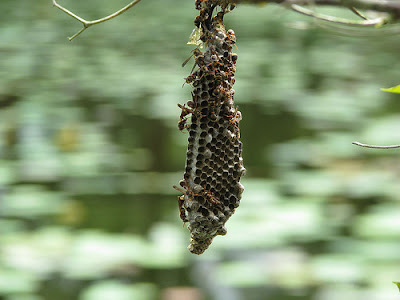 Paper wasps are considered beneficial insects due to their predation on non-beneficial garden pests. 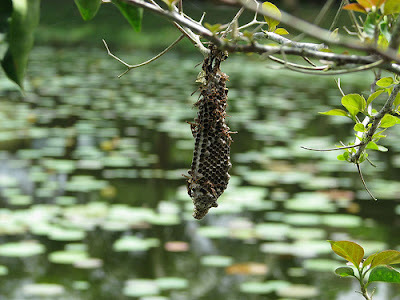 Unfortunately, wasps will defend their nest if disturbed and sting repeatedly.